If you love a magnet, set it free. If it comes back to you, it’s due to a temperature called Curie. Look, I’m not a poet. Just read this. Magnetism requires a degree of order. A magnet is a piece of metal in which the magnetic moment of its atoms are in line. We’ve talked before about how magnetism and temperature affect each other. Impose a magnetic field on a regular piece of metal and, as the order of its magnetic moment increases, the disorder of the motion of its atoms increases, causing the metal to heat up. Heat can also destroy magnetism. We can see the mechanism for this when we look at extremes. A sea of molten metal is not going to have orderly atoms. Every metal has a temperature called a Curie temperature, or Curie point. It is this temperature at which the metal loses its ferromagnetic properties. Ferromagnetism is what you think about when you think about a regular, stick-it-to-your-fridge magnet. When heated past the curie point, the metal retains paramagnetism, the ability to respond to a magnetic field, but it can’t impose that magnetic field anymore. Different metals have different Curie temperatures. Some are high, some are low, and some are uncanny. 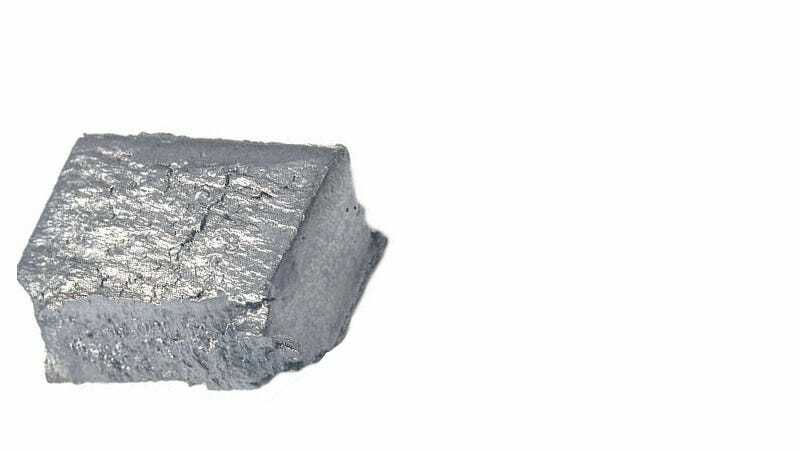 Gadolinium, a metal that sits in the little auxiliary section of elements hung below the man periodic table, is an uncanny one. It is ferromagnetic right at room temperature, but heat it up a little more, and it loses its ferromagnetic properties. So pick up gadolinium and hold it in your hot little hand to figure out how magnetism works, and it will stop being a magnet.